Although symptoms are common following a car accident, they are not necessary for damage to be present. Unfortunately if spinal misalignments are asymptomatic and left uncorrected, they can lead to excessive wear and tear of spinal joints, also known as degenerative disc disease and degenerative joint disease. Chiropractic adjustments help to prevent this wear and tear. Your chiropractic exam and adjustments are generally covered in full by your automobile insurance policy, whether you were the driver, passenger or pedestrian. It does not matter who was at fault. Our goal is to maximize your health and well being. An accident traveling at as little as 10 M.P.H. 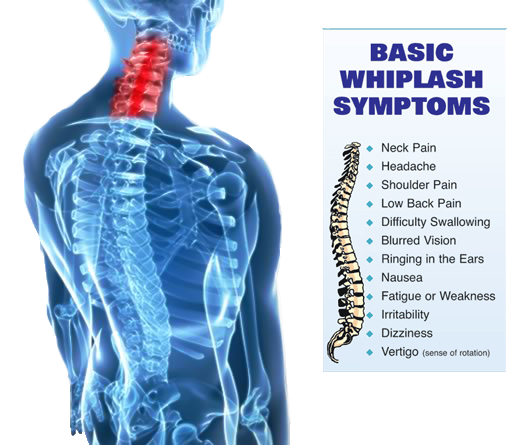 can produce whiplash.